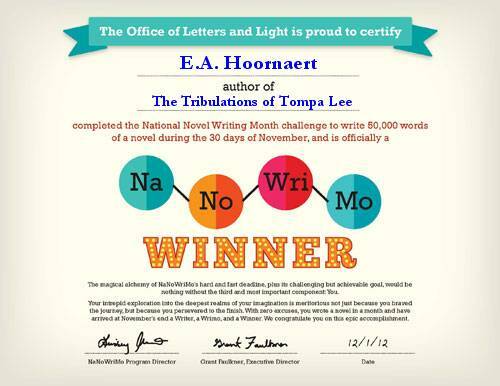 ‘It’ being completed the National Novel Writing Month challenge. If you aren’t familiar with NaNoWriMo, it’s a worldwide program that challenges people to write 50,000 words of a novel during November. Although 50k is a short novel (they’re usually at least 70k to 100k), it’s an ambitious goal, especially for a slow writer such as me. I decided to finish a novel tentatively called The Tribulations of Tompa Lee. After writing The Trial of Tompa Lee, I knew Tompa intimately, so to speak. I also knew the world on which she lived, as well as several species of intelligent aliens and the politics of the Galactic Trading Council. I’d started a sequel to Trial a few years ago, so I already had 25,000 words. The ideas had had plenty of time to gestate. I did NOT write by the seat of my pants, as I usually do, but outlined every scene. I followed (rather loosely) the procedures outlined in painstaking detail in Karen Wiesner’s First Draft in 30 Days , which I recommend for pantsers trying to goose themselves into writing more quickly. And so, picking up from where I left off, I wrote a little over 55,000 words by November 26, 2012, when I typed the sweetest of all couplets: The End. The finished product, The Tribulations of Tompa Lee, requires a fair amount of editing, but it should be available in February or March of next year. It is a science fiction novel with romantic elements. The goddess from outer space moaned in her sleep and thrashed from side to side. Another nightmare. The third one tonight. Awmit’s heart ached with pity and affection, but he could give no help. Waking the graceful human from a nightmare was dangerous, as tender bruises attested. Although she loved him as much as he loved her, she would lash out in her sleep if he so much as crept from his sleeping palette, which guarded the door of her bedroom. Awmit remained motionless and silent, his nerves raw with compassion, staring into the troubled night with large, grey eyes. The tiny device in Awmit’s ear rendered the words into his language. He wished it wouldn’t. Wished he didn’t know her pain. The agony of her regret was profound, yet incomprehensible. She had killed those of his people who sought to kill her. Her immense valor had saved her life—and his. How could guilt arise from such robust righteousness? Awmit loved graceful human, but he didn’t understand her. Awmit was old and humble and nowhere near as smart as most of her followers, yet an idea blossomed like the fragrant, orange and white petals of a tattinbush flower. Every goddess needed a statue. If her adorers constructed a likeness of graceful human to show their love and respect for her actions, perhaps her guilt would wither and her sleep stretch peacefully across the night, like a warm and cozy blanket. Just a small effigy, no more than three times life size. Such a sculpture might be made in the span that humans called a week, given the many hands eager to shape the clay. Yes, yes, he would do it. When day rose from its slumber he would petition the dwarain to sculpt a statue so his beloved friend and goddess, Tompa Lee, could sleep.